(Feb. 12, 2019) – USF St. Petersburg will unveil a new installation that highlights the University’s sustainability identity at 4 p.m. on February 12. 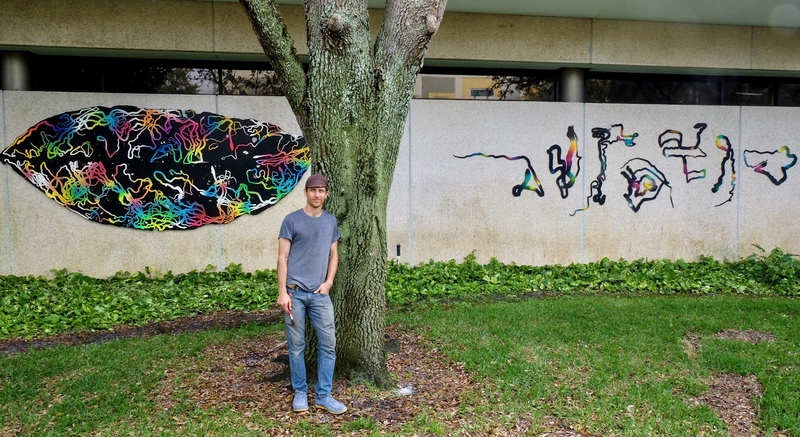 Based on local artist Kenny Jensen’s previous work depicting magnified and colorized patterns made by leaf miner insects, Paths of Consumption: USFSP is in part a collaboration between the artist and USFSP students. The technicolor sculptures will be installed on the north wall of Davis Hall across from The Grind. A companion exhibit titled Interweaving Paths is currently on display in the Nelson Poynter Memorial Library Gallery. Over the past month, Jensen has presented his work to USFSP students in economics, marketing, biology and art courses, taking them on walking tours to explore the natural patterns found around campus. He partnered with four of the students to create the new installation. Jensen asked the students to consider and map out paths they take in their own lives, from running routes to daily commutes. He then reinterpreted these patterns into the style of his previous Paths of Consumption pieces. The results are technicolor wooden sculptures made of meandering, snakelike lines that grow wider as they grow longer. The reveal of Jensen’s art is one part of The Points of Intervention (POI) Repair + Reuse Fair, which the Clean Energy and Resource Conservation Commission (CERCC) and the Post Landfill Action Network are bringing to campus all day on February 12th. The POI tour is an annual event that offers educational sessions on sustainable consumption habits to a handful of universities around the country. The event will bring together local and national businesses and activists to Harborwalk from 12:00 p.m. to 4:00 p.m., followed by the Paths of Consumption: USFSP reception and a speaker series that evening. Jensen’s fascination with natural Florida goes back as far as he can remember. Born and raised in the Sunshine State, he spent much of his childhood exploring the balmy backwoods and swamp surrounding his grandfather’s cabin in rural Gulf Hammock. This is where he developed habits of observation and specimen collection that would later supply his art with creative inspiration and materials. As Jensen replicated these patterns, he drew connections between them and his own life experience. He was particularly inspired by meandering patterns in wood and leaves that are formed by insect larvae as they consume the organic matter before emerging and embarking on their next stage of life. 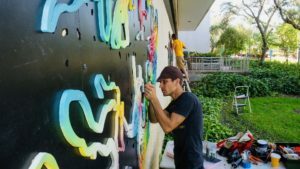 Having seen Jensen’s work in the past, USFSP’s Public Art Coordinator Ann Wykell decided he’d be the perfect artist to feature on campus. Jensen hopes his installation will spark dialogue about sustainability, environmental impact and consumption, and perhaps even encourage people to observe the paths they trace as they stroll through campus.